Neuropathy is defined as the damaged caused to the nerves, and diabetic neuropathy refers to the nerve damages caused due to diabetes. Diabetes damages body nerves as a result of increased levels of blood glucose. Diabetic neuropathy is the most commonly found complication of diabetes. The report “Global Diabetic neuropathy Market” for the projected period 2016 to 2021 has been segmented on three different parameters. The global diabetic neuropathy market has been primarily studied on the basis of different categories of Diabetic neuropathy such as Peripheral, Autonomic neuropathy and so on. The Diabetic neuropathy market has also been studied on the basis of different treatment methods such as Antidepressants for e.g. Duloxetine (Cymbalta), Nortriptyline, Electrical Nerve Stimulation and many more. The market has also been studied on the premise of different geographies and the penetration of Diabetic neuropathy disease in those geographies. 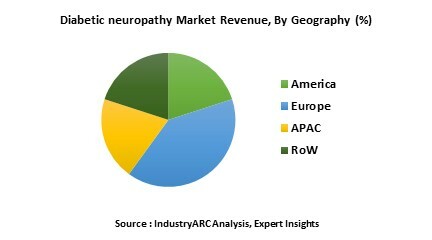 North America is currently the dominating the global diabetic neuropathy market, followed by Europe. This can be attributed to the increasing number of patients with diabetes, surge in research and development activities on cure of diabetes or its related complications, and developing healthcare infrastructure in the region. The diabetic neuropathy market in Asia is expected to attain significant growth rate in the coming years. In addition, increasing number of diabetic patients in developing countries such as India, China, and Japan are expected to lead growth in the Asian diabetic neuropathy market. Increasing prevalence of diabetes cases, aging population are some of the key factors driving the global diabetic neuropathy market. However, the global diabetic neuropathy market is being restrained by factors such as the high failure rate of the clinical trials, stringent government regulations. The Diabetic neuropathy market report also comprises of the leading companies profiled in an extremely descriptive manner. The company profiles include financial summaries, strategies, recent developments and product portfolios of the leading companies in the Diabetic neuropathy market. The report also incorporates a profound study of the market entropy, market forces and strategic analysis of the Diabetic neuropathy market.